MOSCOW, February 1. /TASS/. Russian prosecutors have wrapped up a criminal case against four employees of Energiya Rocket and Space Corporation complicit in the crash of a Proton booster with three GLONASS satellites and sent the case files to a court of law. "Deputy Prosecutor General Viktor Grin has endorsed the criminal case’s indictment against Energiya employees Stanislav Balakin, Sergei Lomtev, Alexander Martynov and Yuri Bolshigin," spokesman for the Prosecutor General’s Office Alexander Kurennoi told TASS. 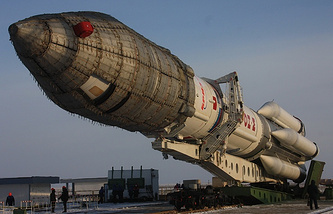 According to investigators, the Energiya employees are complicit in the crash of a Proton-M carrier rocket with three GLONASS-M satellites on December 5, 2010. The damage to the state amounted to over 4 billion rubles (about $65 million). "The investigation has established that the crash was due to the application of a wrong formula, which resulted in putting an additional 1,582 kilograms of liquid oxygen into the acceleration unit’s oxidizer tank. This error led to the carrier rocket’s injection into an open orbit and its subsequent fall into the Pacific Ocean," the spokesman said. According to the spokesman, Energiya department head Balakin, section head Martynov and his deputy Lomtev responsible for developing operational documentation failed to ensure that their subordinate, engineer Bolshigin, should timely adjust the calculation formula for resetting the fuel control system. "The document on the need for such adjustment was submitted to the organization’s relevant department but was written off by the engineer as fulfilled. As a result, the calculation formula remained unadjusted," the spokesman said. "Subsequently, Balakin, Martynov, Lomtev and Bolshigin who knew for sure that the formula for the calculation of the fueling level contained incorrect data that could not be used during a rocket launch agreed operational documentation without pointing to a mistake in calculations," the spokesman for the Prosecutor General’s Office said. The prosecutors have sent the case files to the Moscow Region’s Korolyov City Court to examine the merits of the criminal case.